Sweeping London’s famous skyline at 135 metres high, the London Eye is the world’s highest observation wheel. 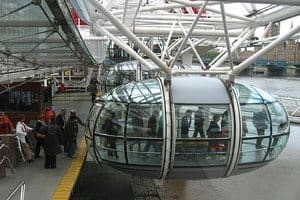 This unique attraction offers unrivalled views and a totally fresh perspective of London’s landmarks, particularly when welcoming overseas visitors. Team Tactics offer a fully managed London Eye hospitality experience, assuring a truly exhilarating experience. The gradual 30 minute, 360º rotations will give passengers a bird’s eye view usually accessible only by helicopter or plane. 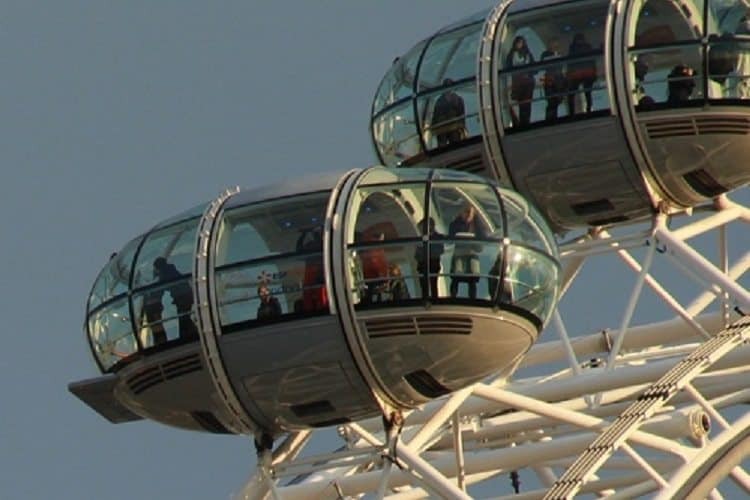 The Eye rises to 450 feet above the river Thames, with 32 high tech fully enclosed capsules. During client’s airborne journey, there will be an ‘in-flight’ commentary to enhance this amazing experience, whilst Champagne and canapés can also be arranged. Team Tactics are able to arrange corporate hospitality aboard the London Eye for 25 to 400 guests. Our corporate packages for the London Eye provide some truly breathtaking opportunities for client entertaining. We tailor our packages to suit your requirements; however, many of our London Eye packages include a lunch or dinner in a private room at London Marriot’s County Hall. After your London Eye rotation guests will move onto the 5 Star London Marriott County Hall Hotel on the banks of the River Thames. Here you and your guests will enjoy a superb three course a la carte menu with half a bottle of wine and mineral water per person. Team Tactics are able to arrange private dining rooms here for guests also. After your fantastic flight on the London Eye seeing the wonderful sights of London, you can then have either a lunch or dinner at Mosimann’s within one of their stunning private dining rooms. 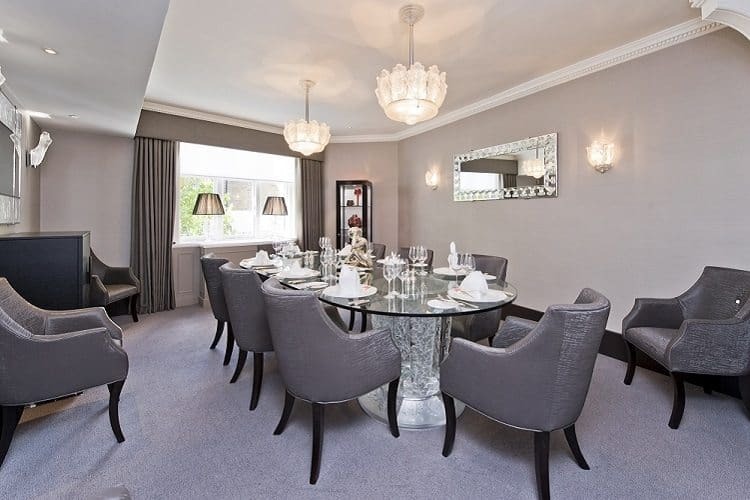 Mosimann’s is a private dining club located in Belgravia, near Buckingham Palace. It sits within a converted 19th century church, creating an elegant whilst exciting atmosphere as a result of its unusual interior. The Balcony Bar allows guests to take in the grandeur of Mosimann’s main room whilst the stunning private rooms offer a range of different interiors as a result of their sponsorships from luxury brands such as Bentley, Montblanc and Davidoff. Fab day, enjoyed by all. looking forward to our next event. viewing London from the eye is an experience you would not want to miss. Top this off with dinner at Mosimann’s makes it the perfect evening. The perfect way to view London. Thank you so much for arranging a wonderful afternoon for us on Tuesday. The team thoroughly enjoyed themselves and the cab treasure hunt, topped off by the trip on the London Eye was a great way for many of them to see London as they usually never get to see anything other than offices and hotels when they come to visit. The champagne and canapé reception was very impressive. Thanks again for arranging everything, I will most definitely be calling on your services and will not hesitate to recommend Team Tactics to other parts of our business. The event went really smoothly. The venue was in a perfect location and the staff were friendly and efficient. Our account manager from Team Tactics was delightful, organised and a pleasure to work with. We were really pleased with the London Eye experience although in retrospect we would have done 2 rotations to allow extra time to drink the champagne! The food at the venue was divine. All in all a hugely successful event, thank you! My thanks to yourself and all your colleagues for your hard work in helping us to stage our corporate event at the London Eye. Everyone was extremely complimentary as to the manner in which the whole evening was organised which is very much due to the efforts of Team Tactics.